Organometallic complexes have two main parts. The first is the central metal atom or ion. Second comes the nonmetallic molecules that bind to the metal, called the ligands. Metals don't usually do much quality work on their own, so tons of research has gone into creating ligands that impart a desired function to a particular metal ion. Scorpionate ligands have three different sites that can bind to a metal ion. 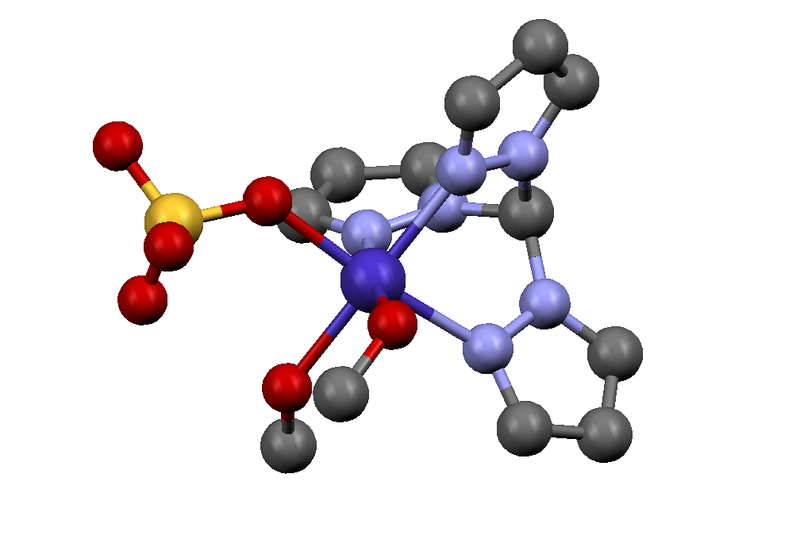 Traditionally, scorpionates are used in octahedral metal complexes, and all three of the binding sites bind to one triangular face of the octahedron as shown in the cartoon at left. Metal-scorpionate complexes are quite strong for two reasons. First, the ligand is tetrahedrally-shaped. Tetrahedra have triangular faces, so sticking the triangular ligand onto the octahedral metal is a bit like snapping Lego blocks into place - the ligand does not have to distort much to make it work. Secondly, scorpionates bind strongly due to their multiple binding sites. The chelate effect shows that one ligand that binds the metal multiple times (a chelate) is always more stable than several singly-bound ligands due to a smaller decrease in entropy for the multiply bound case. Put simply, molecules like to be able to flop around, and chelate molecules lose less floppiness than non-chelate molecules, which makes the metal-ligand bond stronger. Scorpionates were discovered by Dr. Swiatoslaw Trofimenko in 1966 during his time at DuPont. At that time, researchers at DuPont actively pursued side projects. As Dr. Trofimenko said in a 2003 interview with Chemical & Engineering News, the first scorpionates came out of his interest in reacting boron compounds with pyrazole to create trispyrazolylborates (abbreviated Tb). He reacted Tb with metals to study coordination chemistry. The complexes he isolated showed two arms of the Tb ligand grabbing onto the metal ion, with a third reaching over the top, much the way a scorpion grabs its prey before delivering a sting. Trofimenko coined the term "scorpionate" and the name has stuck ever since. Trofimenko's work resulted in over 100 published articles, plus a book. An American Chemical Society symposium was held in his honor in 2003, and he died in 2007.
from crystallographic data in Silva et al. Dalton Trans. Trispyrazolylborates provided a new ligand geometry that allowed chemists to investigate a huge number of complexes with facial geometry. The structural aspects of scorpionate complexes, which can be easily modified to target different sizes or electronic properties, are still being explored. Trofimenko preferred to research the synthesis and structure of scorpionates more than anything, telling C&E News, "I consider myself a gunsmith rather than a hunter." However, research on scorpionates has evolved in many different directions to include more applications-focused projects. 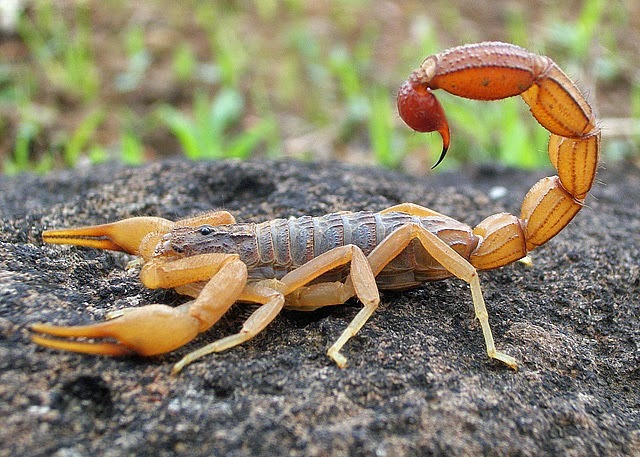 Given that scorpions themselves are hunters, three recent publications on metal scorpionate complexes are featured below. The authors of this study have found a way to combine esoteric structural inorganic chemistry investigations with practical forays into cancer therapy research. They synthesize a number of cobalt scorpionate complexes and study their crystal structures, one of which is pictured above. The complexes are formed after the breaking of a cobalt-sulfonate bond, which is an uncommon reaction motif. The cobalt scorpionates mediated DNA cleavage in vitro by an undetermined mechanism, and also were found to be active in killing colorectal cancer cells. If you get excited about cool crystal structures, this is a paper for you. The researchers who published this study inspected a known zinc metal organic framework called MFU-4 and found coordination centers reminiscent of scorpionate complexes. They then used a series of reactions to displace some zinc centers with copper(I) ions, and in another step stripped chloride from the MOF, resulting in exposed copper(I) ions with open coordination sites. Such sites are anticipated to be very reactive. They then demonstrate that the modified MOF effectively performs some hydride transfer reactions and shows activity towards small molecules interesting to energy science. In this paper, the authors expand on some of their previous work by preparing new members of a series of zinc scorpionates contaning only to pyrazole units. The tail of the scorpion is left available for synthetic modification. The researchers prepare an interesting dinuclear zinc scorpionate where one zinc is octahedrally coordinated, and the other is tetrahedral. Several complexes in their series were active towards the polymerization of lactides and lactones, evidently by an attractive living single-site mechanism.